Erin Schrode is out to change the world. She’s had her eye on that prize since I met her a decade ago in Marin County, where she grew up. 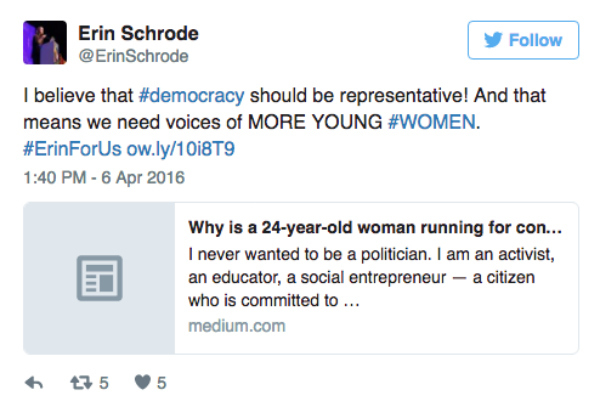 At 25, Erin is running for United States Congress in California’s District 2. If she wins, she’ll be the youngest woman in history and the first woman under 30 to ever be elected to Congress. Read more in this exclusive interview with Erin Schrode. 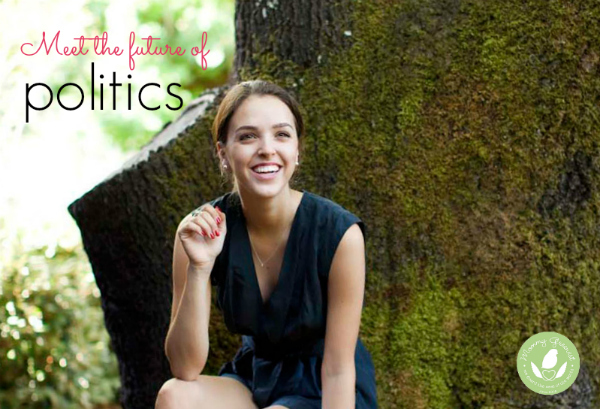 When I first met Erin Schrode she was a teenager empowering other teens to speak out and step up through Turning Green, the non-profit organization that she co-founded at her kitchen table in 2005. Since then, she’s launched a youth education in Haiti, fostered eco education in the Middle East, developed recycling infrastructure in Ghana and worked with refugees in Greece. She organized corporate protests wearing prom dresses and combat boots and stood up for #BlackLivesMatter. And she’s been featured too many news outlets to count, including the New York Times and CNN. All while finishing college, of course. Once you’re done reading the interview, join me and donate to the Erin Schrode campaign. It doesn’t have to be a massive donation! This is truly a grass-roots effort and every bit helps. Oh, and if you don’t live in California’s District 2—why should you care? Because this powerful woman could become a game-changing politician. Remember when we celebrated because the DARK Act was voted down in the Senate? It passed the House. Erin’s voice in Congress will be one we can trust to keep environmental and social justice issues front and center. We need as many of those voices as we can get. Remember when we celebrated because the DARK Act was voted down in the Senate? It passed the House. Erin’s voice in Congress will be one we can trust to keep environmental and social justice issues front and center. We need as many of those voices as we can get. I am an activist, an educator, a social entrepreneur—a citizen who is committed to environmental action, public health, and equal justice… and this congressional run is a natural extension of what I am most passionate about, experienced in, and do on a daily basis. I have dedicated my life to civic dialogue and action, yet too many of us are still being ignored, excluded, and discriminated against. There has never been a woman under thirty elected to Congress in history; that must change. Progressive female voices result in better policy; young people are better equipped to lead the future of our nation. Political engagement is key in fighting for justice, health, and equality—so I am stepping up to deliver on the promise of my generation. What do you say to people who criticize you for not having experience? Experience matters. But are years in law, policy or government more valuable than those spent working in activism, education, and entrepreneurship? Varied, insightful global experience carries weight, in my mind, more so than walking the halls and closed rooms of Washington or corporate headquarters. And I do have policy experience on the local, state, and federal levels—working on concrete legislation to protect human and environmental health. I have not spent decades entrenched in existing power structures, but I think that perspective adds clear value. How do you feel about running against opponents who are career politicians? The best qualified person is not necessarily an older male or career politician; that can no longer be the default. Young certainly does not mean less capable. If we are disappointed with the way our country, states, and cities are run, we must elect people to office who will be bold enough to take risks and challenge the status quo. What has been your greatest gift? My mother, my best friend and guiding light, instilled in me two values from a very young age: optimism and activism. We maintain hope in creating a new possible and take concrete action to bring it to life. From a young age, she taught me the power of Margaret Mead’s words, “Never doubt that a small group of thoughtful, committed citizens can change the world; indeed, it’s the only thing that ever has.” I’ve never forgotten them. Donate and share! 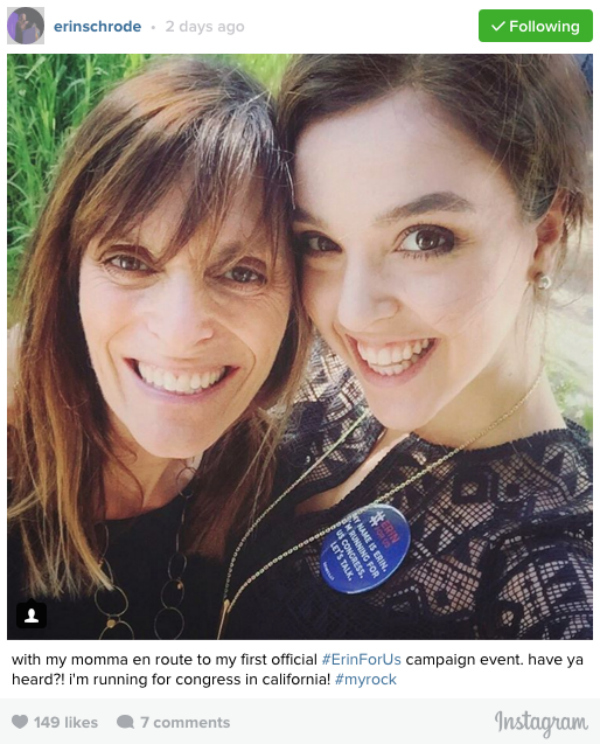 Our two primary goals right now are funding to build the campaign that we need to win and name recognition, so that people in California’s District 2 VOTE for Erin Schrode in the June 7th primary election. Contribute at erinfor.us/donate. It takes concrete funds to build and run a campaign—and all support is hugely appreciated. Know anyone in Marin, Sonoma, Mendocino, Humboldt, Trinity or Del Norte counties (from the Golden Gate to the Oregon border)? 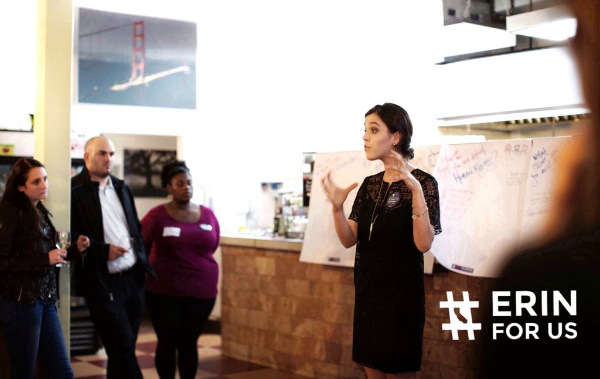 Tell them about Erin Schrode, the progressive candidate that is redefining civic engagement and uniquely equipped to deliver as their elected representative! I want to meet them and earn their vote. Follow, like, and share our content on Facebook (www.facebook.com/erinforus), Instagram and Twitter @ErinSchrode, Tumblr, and even Snapchat! We are opening up the campaign trail to YOU. Join us! Volunteer! We welcome all expertise—and rely on the power of people to grow our movement and execute effectively!